Feedback is used in a variety of ways. It can be used to flatten the gain versus frequency of an amplifier (almost always used in one-stage wideband amps with flat gain). Often, it is used to raise the K-factor of an amplifier stage to provide unconditional stability. Feedback is also used in low noise amplifiers to change the input matching characteristics. There are two types of feedback, series and parallel. Series feedback is realized by adding lossless inductance in series with the FET source connection before it terminates in RF ground. 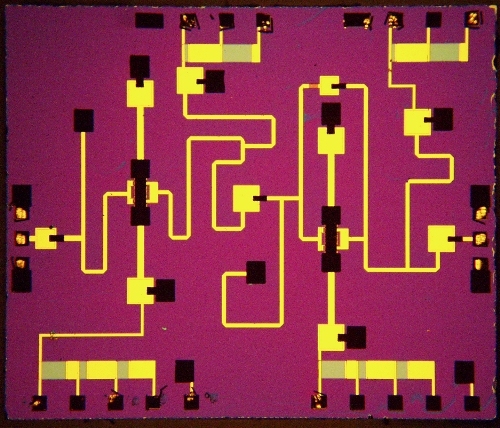 This tends to reduce available gain from the device (and the gain degradation increases with frequency), but it has been used to improve the input return loss of low noise amplifiers, and move the location of the best noise match closer to the position of the conjugate match. In practice, the feedback that is needed is rather small. In some cases, moving a FET's source ground connection just a hundred microns is all the feedback you'll want. Below is an obsolete low noise amplifier, with series feedback in both stages (RF input is on the left) and parallel feedback on the second stage. The series feedback is accomplished by the north/south transmission lines that leave the first FET and eventually get grounded by via holes (under the dark metal squares). From the length of the feedback lines, you might guess this is an X-band LNA. At higher and higher frequencies, the optimum feedback gets smaller and smaller. 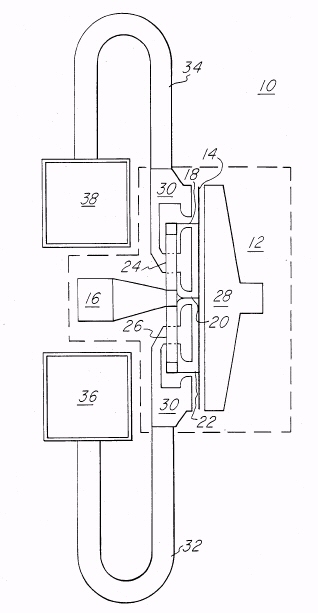 Series feedback in LNAs is actually covered by U. S. patent 4,614,915, Monolithic series feedback low noise FET amplifier by inventors Heston and Lehmann, 1984. These two Texas cowboys claim to have discovered that by adding series feedback to the source of a FET, it is possible to move the input impedance match for lowest noise (ZOPT) very close to the input impedance match for maximum gain (S11*). (Be sure to keep reading the paragraph below as to the validity of this patent.) It seems like the assignee of the patent (Texas Instruments originally, probably TriQuint by now) never tried to enforce it, nearly all LNAs use this technique today and few designers know that it was once patented! Here's an image we cribbed from 4,614,915. The series feedback lines are 32 and 34 which connect the source (24 and 26) to vias to backside ground (38 and 36). Note that this FET has but a single gate finger (it's vertical, fed by 16). 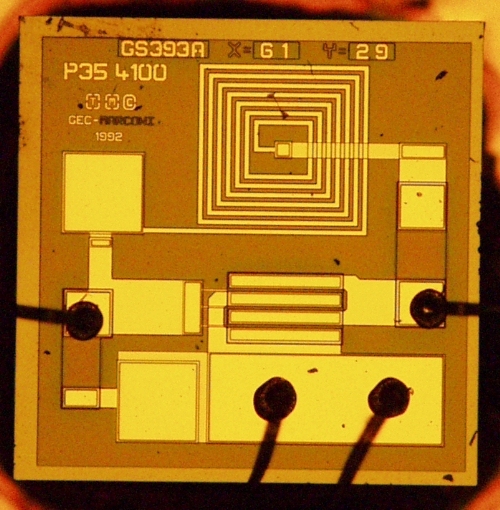 One thing that the inventors didn't think of was to use bypass capacitors to establish RF ground to the source, this design can't be self biased with source resistors like the MMIC LNA we discuss on this page. In parallel (or shunt) feedback, a path is introduced between the output of a FET (drain) and the input (gate), parallel to the signal. It must have a high-pass characteristic, because the DC potential at the gate and drain terminals of a FET are never equal. Often it is a lossy path, and includes a resistor (a series RLC network is most common). The obsolete Daico-GEC-Marconi-Bookham P35-4100 amplifier is a good example of a MESFET feedback amplifier MMIC. You can see a shunt RLC path from input to output (left to right). The large spiral inductor on the top of the chip is part of the feedback network. A capacitor just above the input RF bondpad forms the DC block in the feedback path. The "clear" square of material just above the output bond pad is a series resistor, also in the feedback path. The purpose of the feedback on this one-stage amp is to equalize the available gain over a wide frequency band (50 MHz to 5 GHz), so that when the input and output are matched, flat gain is the result. It probably also helps make the part unconditionally stable. So how come we can get away with a feedback connection from output to input of a FET amplifier? Shouldn't this make the device unstable, you ask? The answer is that MESFETs (and PHEMTs) are depletion-mode devices, which means that a positive voltage excursion on the input will produce a negative voltage excursion on the output, so if you feed back a part of the signal, it is negative feedback. Talk about serendipity! You still have to be careful, the feedback path has to be kept electrically short or you may get positive feedback as you go up in frequency and create an oscillator.